Are you looking for a stylish and affordable way to improve your home? Count on the full selection of tile flooring carried in our showroom. Whether you’re looking for something specific or you need style advice, we’re sure to have something to suit your needs as well as your budget. With a wide range of tile flooring prices and styles to choose from, some people may feel overwhelmed by choices. Let us sit down and discuss your project with you so we can help narrow your selection and make things easier. Whether you choose porcelain, luxury vinyl, or ceramic tile flooring, it’s important to protect your purchase. Be sure to schedule tile flooring installation with our skilled and dedicated flooring professionals so your new floors are sure to last for many long years. Nobody likes spending all their time cleaning their floors, so ceramic tile flooring is an ideal choice for any home. Because tile doesn’t absorb moisture or dirt, it’s easy to sweep up dust, dirt, pet dander, and other allergens as needed. With regular sweeping and mopping with a mild cleaning solution, your tile flooring is sure to look and function great for many years to come. Protect your investment and ensure your flooring is installed safely by scheduling tile floor installation by our skilled team of professionals. Our floor installers are able to fully remove your old flooring, prepare the subfloor, and properly install your gorgeous new tile flooring. By allowing us to handle the installation, you’re able to save yourself significant time and energy. We have the experience and equipment to handle installation projects of virtually any size, so make sure to discuss your project with our team. When you’re looking for new flooring, it’s important to choose high-quality materials without breaking the bank. At our flooring showroom, we carry a full range of tile flooring options by leading manufacturers like Floorcraft and Emser. Whether you’re looking for glazed porcelain tile for the appearance of wood or a brick-like ceramic paver for a unique appearance in any room, we have a full range of options to choose from. If you’re not sure which tile suits your home best, feel free to sit down with our flooring experts to get advice on our many tile flooring options. 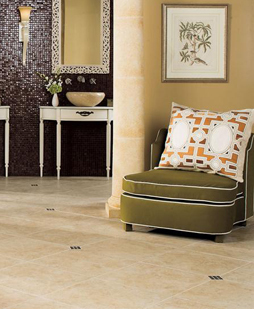 Contact us when you’re looking for high-quality tile flooring. We’re proud to serve customers in Turlock, Hillmar, Denair, Hughson, Oakdale, California, and the surrounding areas.